Water makes up more than 55 percent of our bodies, more than 70 percent of our hearts and brains, and over 80 percent of our lungs and blood. It even occupies 31 percent of our bones! Water is essential to us in a myriad of ways, from the body at large to the most minute aspects of our health. The health implications of drinking enough water are immense—especially when it comes to fertility. 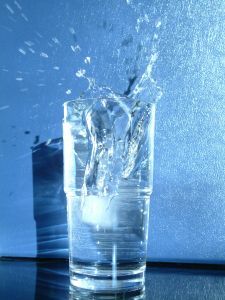 Water allows nutrients to be absorbed properly by our bodies and organs, including the ovaries. Healthy eggs make for healthy conception and healthy babies—the best reason of all to drink up. Cervical mucus is a fluid secreted by the cervix and is an incredibly important aspect of fertility. It’s made of 90 percent water. Drinking plenty of water thins out and increases the production of cervical mucus, increasing fertility and aiding sperm on its journey toward your egg. Many fertility issues are related to hormonal imbalance in our bodies. In fact, more than 30 percent of infertility cases in women worldwide are caused by hormonal issues, including thyroid imbalance, pituitary dysfunction, insulin resistance, and more. Hormones travel throughout the body—for instance from your brain to your ovaries—through the blood. And guess what blood is mostly comprised of? Water, of course. By drinking adequate water, we can support the transportation of hormones throughout our bodies, boosting fertility. If we’re not supporting our body’s natural ability to rid itself of dangerous toxins, they start to build up and cause health issues—infertility included. The kidneys and liver rely heavily on water to function properly. The kidneys rid the body of toxins through the creation of urine—and urine is dependent on adequate water. Drinking enough water also allows the liver to rid your body of more toxins, helping it do its job faster and with greater ease. Proper hydration is very important when it comes to breast feeding. Breast milk is 90 percent water and a common cause of low milk production is inadequate water consumption. Getting in the habit of drinking plenty of water throughout the day now will set the stage for healthy breast milk production after birth since you’ll already be used to having your water bottle by your side. When a woman is chronically dehydrated, the reproductive system is usually the first system in the body to shut down, as it is not directly vital to survival. That’s why it’s time to pay close attention to your water intake—especially if you’re trying to conceive. Be sure to drink eight glasses of water—or more—every single day. After just a few days of increasing your water intake, you’re sure to feel more focused, balanced, and healthy. Plus, you’ll be improving your cervical mucus quality, assisting hormonal transport, detoxifying your body, and boosting your overall reproductive health. Let’s raise our water bottles to that!